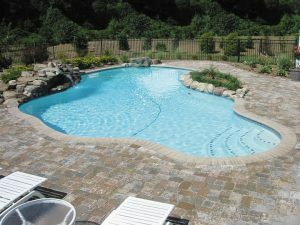 To prepare your pool for the winter, you will have to cover it up until the local forecast says the weather is finally warm enough for you to use it again. Everyone loves a good pool. A pool is perfect for cooling down on a hot summer day. Even when it is not hot out and just feels a tad cool, a pool is still a fantastic home feature to enjoy on a cool, summer day. Unfortunately though, with winter approaching, the time you have to use your pool will be on pause until warmer weather comes around. To prepare your pool for the winter, you will have to cover it up until the local forecast says the weather is finally warm enough for you to use it again. Pin down covers are the most common covers people use when the winter arrives. They are the most affordable option on the market so that you will find a pin down cover over almost any pool. Due to the amount of effort and difficulty they require to put on and off, most owners typically just put them up in the winter and leave them be until the winter is over. The two kinds of pin down covers are mesh and solid. The mesh cover prevents large debris and leaves from falling into your pool during the winter. However, rainwater, melted snow, and other types of small debris will be able to get past them. Solid covers are more commonly used to prevent a chemical change in the water, and protecting it from sunlight and contamination. Mesh covers allow you to wait until the spring to clean debris out, while solid covers will require you to clean debris out regularly during the winter. A pricier option for a pool cover comes in the form of thermal covers. By having a thermal cover, you will be reducing evaporation. This then helps insulate your pool, which will help keep it warm and available to use even in the start of the winter. It keeps out large debris like other covers, and is easier to remove than a pin down cover so you can easily remove it if you feel like going in for a quick dip. By opting for a solar cover, you are essentially choosing a cheaper version of a thermal cover. Like a thermal cover, you will be able to extend your pool’s life into the first cold days of winter. However, if the weather is cloudy, the solar cover will not be as effective. This entry was posted on Friday, October 12th, 2018 at 10:37 am. Both comments and pings are currently closed.